Fsdz Dash Cam Car DVR, the safest guarantee for your driving! ! ! Super large screen shows the realtime image, combined with1080P full HD 30 FPS recording helps you clearly see every details when playing back and brings better visual experience. You can view the video on the dash cam without download it to your computer/phone. 170°wide angle lens allows a larger viewing angle to be recorded. Reduce blind spots, easily cover all lanes. The more you see, the safer you are. 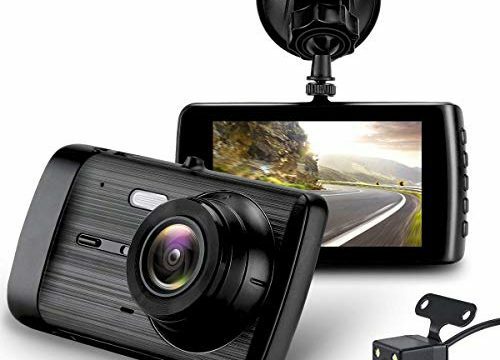 With built-in G-sensor, this dash cam can automatically detect a sudden shake/collision and lock the footage to prevent the video from being overwritten even in loop recording. Important footage is protected, accident scene can be truly restored, then you can stay away from the liar and loss. 24 Hours Loop Recording creates video clips, automatically overwrites the oldest file to save the current file. Infinite loop recording, never miss any moment. Suitable for situations like low light or backlight, you can get comparatively clearer footage and image at night.WDR is able to restore the true colors of objects to the greatest extent. The device is turned on and begins recording automatically with the engine ignition on. It is turned off automatically shortly after the engine is off. – With small battery capacity, external power is required for operating this dash cam. – The working voltage of this dash cam is 12V or 24V. Works both car and truck. – Please format card both in computer and the cam before first using. – When connect with cpmputer, screen shows ‘mass storage’, is only for transfer data with computer. 【3.7 INCH ULTRA HD LCD SCREEN】Super large screen shows the real time image, combined with1080P full HD 30 FPS recording, ultra high definition and sensitivity captures vivid and detailed images even in high speed or fast moving sense. Provide reliable evidence for reference, keep insurance claims to prevent disputes. 【170° WIDE-ANGLE LENS】FSDZ dash cam has a viewing angle up to 170 degrees for ultimately reducing blind spots and obtaining all lanes coverage. 【G-SENEOR And LOOP RECORDING】Triggered by G-sensor, when gravity sensor detects a collision, the dashboard camera will automatically lock videos of unexpected incidents, important footage is protected, Accident scene can be truly restored. Loop Recording allows automatic and continuous playback, then you will not miss any important data. 【SUPER NIGHT VISION】Combined with big aperture and wide dynamic range(WDR), you can get comparatively clearer footage and image at night. Car license plates can be easily seen in low light condition. The safety of driving at night will be improved a lot. Motion detection, parking monitor, timestamp, instant playback, provide a safe driving. 【BUY WITH CONFIDENCE】We offer 3-month money back guarantee and 12-Month Warranty. Feel free to contact us if you have any questions, we provide 24-hour customer services before purchase and after sales.